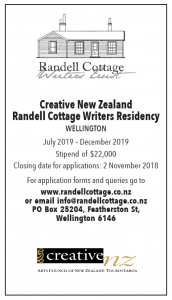 Randell Cottage hosts New Zealand and French Writers. The historic cottage has two bedrooms and a writing studio. Located in inner-city Thorndon close to the Lilburn Residence, Rita Angus Cottage, Wellington Asia Residency, and the Katherine Mansfield Birthplace, and within walking distance of the National and Turnbull Libraries. Subject to Creative NZ funding.